The United States wants a "strong Europe" and is willing to help its ally, but Europe must be fair when it comes to sharing the defense burden, U.S. President Donald Trump said on Saturday. Trump said that Macron "understands that the United States can only do so much." Macron said Europe had to take greater responsibility for its own defense, saying he agreed with Trump on the need for greater "burden sharing" by Europe in NATO. 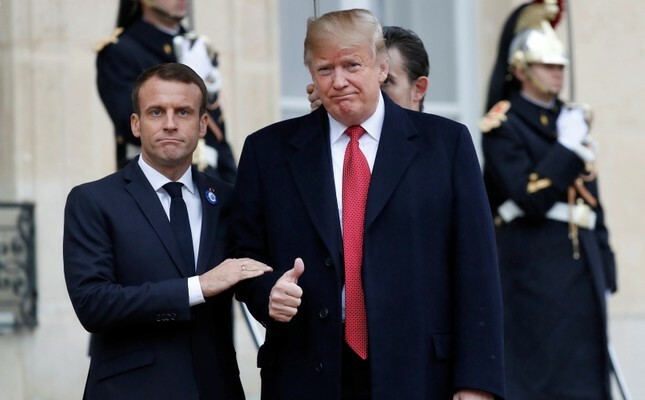 "I am obviously going to share with President Trump the proposals made on Europe's strategic defence capabilities and the need for a Europe that is able to take on more of the common burden at the heart of NATO," Macron said ahead of talks with Trump at the Elysee Palace. "President Macron of France has just suggested that Europe build its own military in order to protect itself from the US, China and Russia," the U.S. president tweeted late Friday, referring to remarks made by Macron three days earlier. His tweet about Macron's EU defense proposals -- which came hours before the two leaders were to hold talks at the Elysee Palace -- referred to the French leader's call in an interview Tuesday for a "real European army." "I am in Paris getting ready to celebrate the end of World War One. Is there anything better to celebrate than the end of a war, in particular that one, which was one of the bloodiest and worst of all time?" he tweeted. The U.S. leader and his wife Melania are on their second visit to Paris since July 2017 when Trump was Macron's guest of honor at Bastille Day celebrations in Paris. The row over European defense came at the start of a weekend of commemorations to be attended by 70 world leaders, including Russian President Vladimir Putin and Turkey's Recep Tayyip Erdoğan. The isolationist U.S. leader has, however, ducked out of a peace conference Sunday, which Macron and Chancellor Angela Merkel intend to use as a platform for promoting multilateralism. U.S. National Security Advisor John Bolton told reporters in Paris on Friday the president had "a lot of pressing issues" to attend to. Macron has repeatedly called for the EU to build up its defense capabilities in view of Trump's demands that the EU shoulder more of the financial burden for ensuring its own security. Macron will meet German Chancellor Angela Merkel at the site, in a visit symbolizing the close ties between two countries that fought three wars between 1870 and 1945.